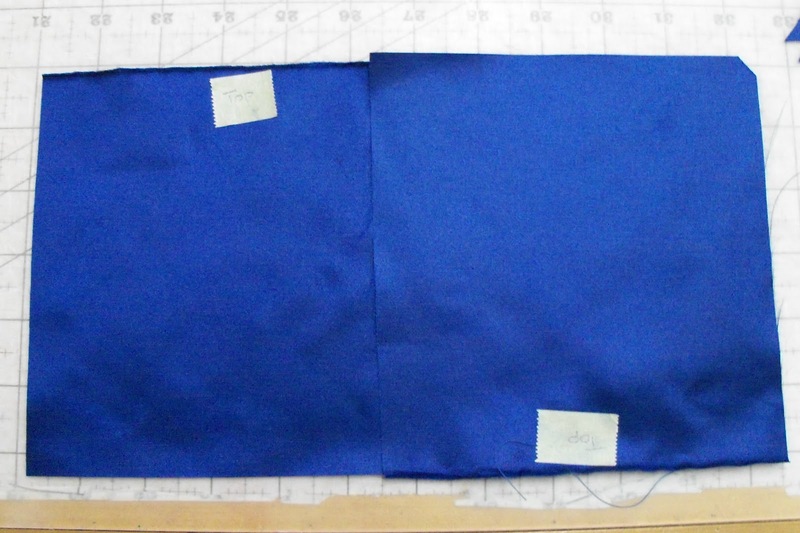 Your replica Caped Crime Fighter cape should now be altered and ready for cutting. Before we begin… We need to discuss that satin can be directional meaning the color will appear darker in one direction over the opposing direction….say what? Notice that when I flip one around how it catches more light then the other. This property of satin if not addressed can make your garment look like it has been sewn with two different colors. It is sometimes difficult to see in small pieces, tragic when seen in larger sections. I always advise avoiding the possibility altogether by careful cutting. To begin cut or tear your satin into 4 lengths of 60″ each. Label the top of each length as you proceed to insure that your satin is running in the same direction for all of your pattern pieces. 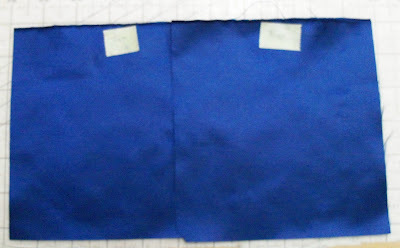 To help conserve fabric you will be placing the pattern pieces in opposing directions as the lay out shows. You will use one direction for your “face” or outer layer, and the other direction for your lining layer. Being careful that you end up with 2 front , 2 front linings, 2 back and 2 back linings. 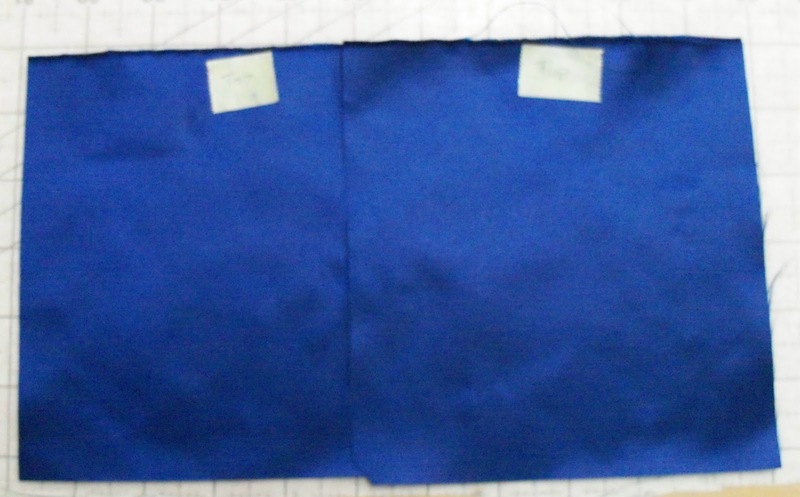 Lay out both your cape front and back as the pattern instructs, but you will only be able to get one set out, the 2nd set will be cut from your other 2 lengths. With dressmakers carbon mark your seam allowances and scallops on the wrong side of all 4 pieces.Additionally you will need to mark your snap location with tailor tacks. I like to use light blue thread for the male snaps and pink thread for the female snaps.You can now cut your pieces along the cutting lines except for the scallop hem. For this I leave a generous edge around until I have fused the bias tape along the scallop. Be sure to label your cut pieces by placing a low tack masking tape on the wrong side of the fabric, to insure you do not confuse your lining pieces with your face/outer pieces. Repeat this with the other 2 lengths, laying the pattern pieces in the opposite direction of the first set. 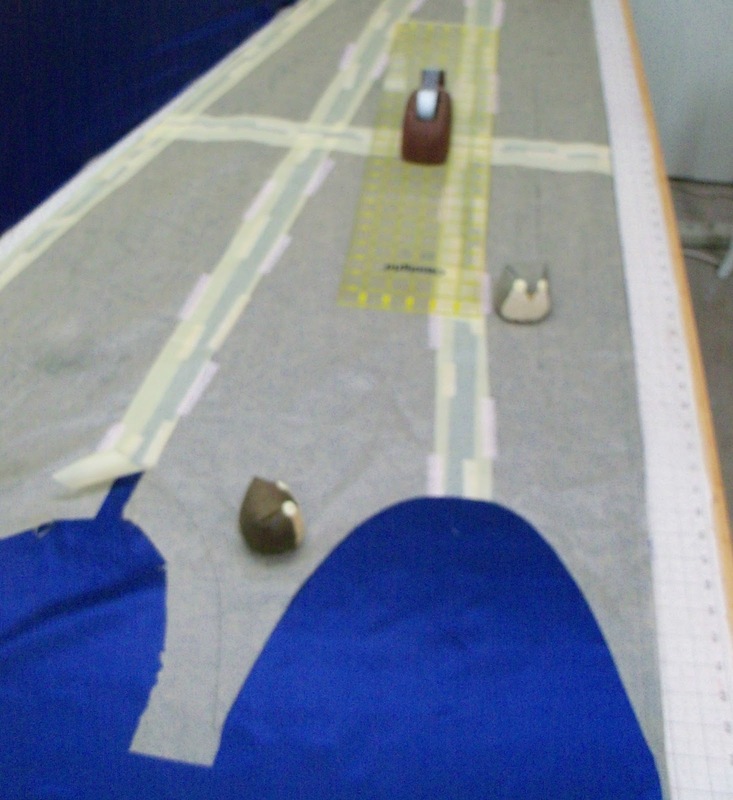 Mark your seam allowances again with dressmakers carbon, tailor tack your snap placement and label each piece. 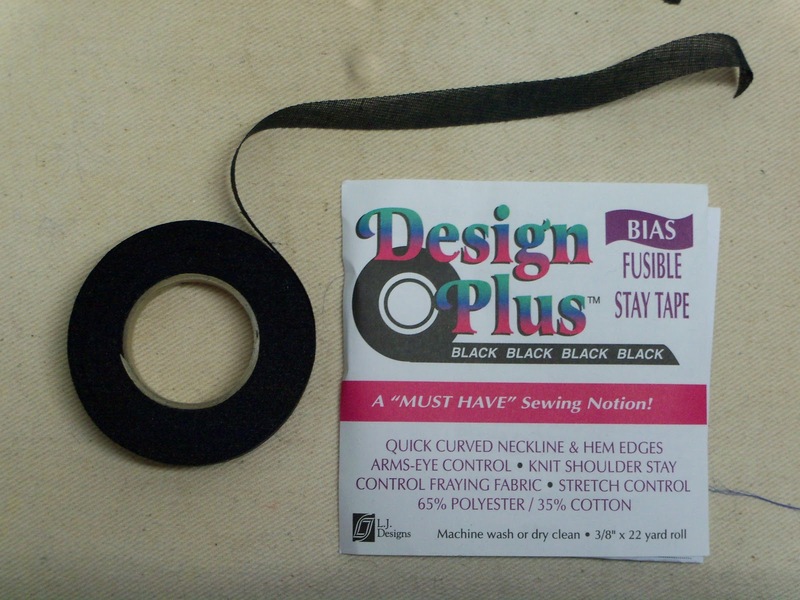 The fusible bias tape used to control the seams. Next to insure that our front edge stays crisp and hangs correctly and that the scallops in the hem retain their proper shape we will fuse a wonderful product called Design Plus bias fusible along our stitch lines in critical sections. 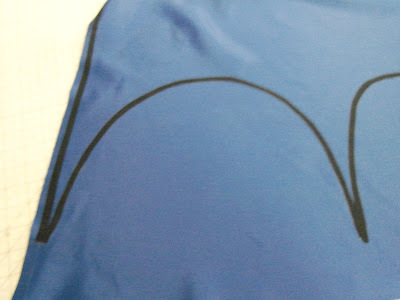 You will iron this tape centering it over your stitch line down the center front on the face/outer side only. You will than iron the tape along the inside edge of your marked hem. If you are using a taffeta like satin you may only need to do this on your face/outer side. If you are using a silk satin or light weight poly satin you will want to fuse both your face/outer and lining hems. I highly recommend you do a test scallop on your fabric to determine what will be required.Leaving the excess fabric makes the hem more stable and less likely to change shape as you press. Additionally you can keep the pattern pinned to the fabric just above the marked line. The tissue will help it retain its shape. Once you have it fused your bias tape on you can trim off the excess fabric right along the edge of the bias tape. Because this tape is cut on the bias it forms around the curves beautifully as you press it and will now stabilize the scallop shape for the finished hem technique. 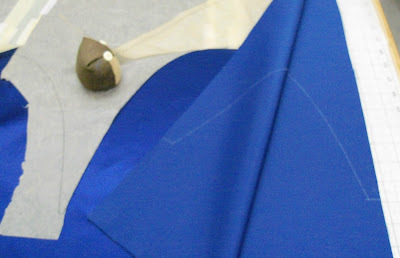 In the next installment we will sew the cape and master that tricky hem.